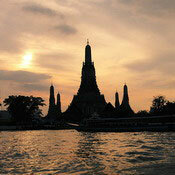 The Temple of Dawn or Wat Arun is named after Aruna, the Indian God of Dawn. 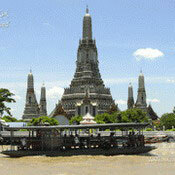 It's one of Bangkok's best known and most photographed landmarks. It is best viewed from the river at dusk with the sun setting behind. This ancient temple was originally known by locals as Wat Makok or The Olive Temple. The temple was built in the days of Thailand's ancient capital of Ayutthaya and its outstanding feature is its central Khmer-style prang reaching a height of some 86 metres. The corners are surrounded by 4 smaller satellite prangs which are decorated by seashells and bits of porcelain that had previously been used as ballast by boats coming to Bangkok from China. Around the base of the prangs are various figures of ancient Chinese soldiers and animals. 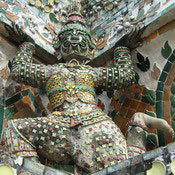 Over the second terrace are four statues of the Hindu god Indra riding on Erawan. This Buddhist temple is an architectural representation of Mount Meru, the center of the world in Buddhist cosmology. In the mythology of Tibetan Buddhism, Mount Meru is a place located somewhere beyond the physical plane of reality that simultaneously represents the center of the universe and the single-pointedness of mind sought by adepts. 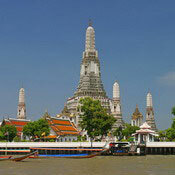 The four-corner prang of Wat Arun, which house images of the guardian gods of the four directions, reinforces this mystical symbolism.